WATCH Unclaimed Money: 'GMA' Viewers Cash In! 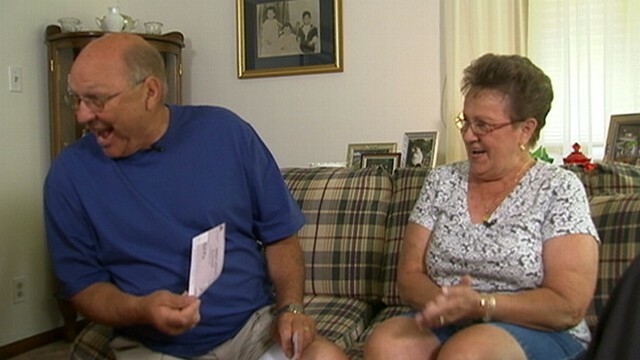 The Shaluta family of West Virginia received nearly $15,000 in unclaimed money that Vickie Shaluta's mother lost track of in the final years of her life and then left behind when she died. So often, that's how it happens and there are two lessons we can learn from their case. We should all take the time to make a list of all our accounts, so that our heirs will know where to look when we die. Keep that list with your will and estate paperwork, perhaps in a safe deposit box. Tell somebody trusted how to access it. In addition to obvious ones such as checking, savings and brokerage accounts, your list should include stocks, bonds, savings bonds, life insurance policies (including those you purchased on your own and others that might be part of your employment package), accidental death policies, pensions (from current and former jobs), 401(k)s, IRAs and any other financial assets you want to give to your family. Here's your motivator: If your family doesn't know about an asset, the state gets to keep it indefinitely and use any interest it earns to finance the government. If a loved one has died and you are the rightful heir, you should search to see whether there is unclaimed money or property in their name. You can do an almost-nationwide search at the free website www.missingmoney.com. You can choose to search a single state or all states that participate. Be sure to check the map of the United States to see states included. If your loved one lived or worked in a state that does not participate with MissingMoney.com, then you can search that state's unclaimed property database directly by going to www.unclaimed.org. Actually, it's not a bad idea to search all 50 states and the District of Columbia regardless, because sometimes unclaimed money is held by the state where a company was based rather than where the customer lived. To be really thorough, Mary Pitman, author of "The Little Book of Missing Money" says don't just search your loved one's name alone. Pitman is a nurse by profession, but became passionately interested in helping people find unclaimed money after she did it for a friend and discovered she had a knack for it. Pitman discovered that many states' unclaimed money databases won't find your deceased relative's listing unless you enter it just right. And many of them list the accounts with other wording surrounding the person's name. Her advice is to type the following terms in the "last name" box of the search page. Dozens or even hundreds of entries will pop up and you can then scan them to see if your relative's name is attached to one of the arcane terms. Pitman is now known as "The Unclaimed Money Fairy," and it's easy to see why: Because her methods work. She has many more tricks and tips and direct links to more unusual places you can search for unclaimed money in her "E-book." Click HERE to for links to sites where you can search for missing money.